This little device qualifies as one of my best impulse purchases to date. For under $30 I now have a full Debian Linux system running 24/7 that uses about 4watts of power. One thing to mention is there are many different versions of the Pogoplug. The model I am using is POGO-E02, which sports a Marvell Kirkwood 1.2GHz ARMv5te Processor, 256MB Ram, 128MB Nand, 4 USB Ports, and Gigabit Ethernet. I splurged with a 16gig Flash Drive to be my boot device and main storage. 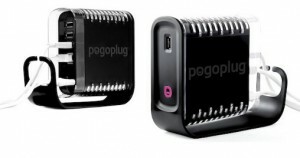 Out of the box Pogoplug allows the user to add external hard drives via USB, which are then made available both locally and over the Internet. However, thanks to the effort of many individuals, there are two prominent OS replacements which can be loaded to expand the capability of these devices. Arch Linux ARM is a popular choice, supporting many of the Pogoplug devices and backed by an active community. Debian Linux has always been my preferred distribution, so I was happy to find there was support for my particular model. Jeff Doozan hosts what seemed to be the definitive guide to installing Debian onto a Pogoplug device. However, I found out during install that due to updates at Debian some of his scripts were now out of date. Luckily, another forum user Shyd was able to modify the install script to support the latest stable release, which at this time is Squeeze. After running the script you are presented with a base Debian install to do with as you please. I configured some default options as suggested by Luke, and then installed Lighttpd, PHP5, and MySQL following this guide. Lastly, I took some ideas from mewbies to customize my shell MOTD to display prominent information at login. I am very pleased with the results and would recommend this as a great low cost learning solution to anyone wanting to dabble in the world of Linux. So a week ago a friend of mine read an article on Engadget about setting up a home file server using FreeNAS. He asked my opinion about the software, not knowing I have been running my own FreeNAS server with great success. The FreeNAS version at the time of this writing is 8.0.3. It has some pretty hefty requirements for what I would consider necessary for home use. I am still using the last stable release of FreeNAS 7 which runs on lower end hardware, and has a few more features then its newer incarnation. When they were on clearance, I purchased a MSI Wind Nettop bare bones system in hopes of making a Hackintosh. 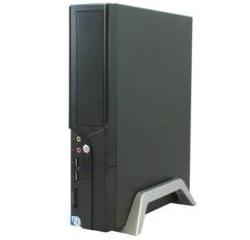 It had similar hardware to the Dell Mini 9 but unfortunately the dual core Atom 330 was not supported, so I put it in the closet. Shortly there after I began having issues with my Apple Time Capsule and needed a replacement. While researching options I found FreeNAS had an embedded install feature. The Nettop sitting in my closet was equipped with a bootable Compact Flash card expansion slot. So I found an old CF card, 1GB ram, and purchased a Green 2TB SATA hard drive. Installing the FreeNAS software was a snap, and after the initial setup all other configuration is done via web page so the machine sits headless in a corner. I formatted the hard drive as a single UFS partition. I then mapped mount points depending on the protocol being accessed. SMB for Windows, AFP for OSX, and RSYNC for Linux took care of my immediate needs. After setting up various user accounts, I set the spin down time for the disk and was ready to go. The only down side with this unit is the lack of redundancy. This was not a concern as I use it solely for backups, but I would at minimum mirror the single drive if it was going to be my primary central storage. Over the years I have developed a need to modify most things that I purchase to make them more than the manufacturer intended. In fact, I now go out of my way to buy items that I can ‘hack’ whenever possible. A good example is my home Internet router, which currently is a Linksys E2000. I say currently because I also own a Netgear WNR3500L, but that is my testing router so the main network connection doesn’t suffer. While talking to a colleague at the office, he stated it would be beneficial if his home wireless channel would auto change as needed. Happily, he said that the open source firmware Tomato was already installed, but he did not see said feature. I pointed out that this particular firmware had not been updated for many years, but was picked up by the TomatoUSB group. Unfortunately, that firmware is also over a year old, but various people have continued to modify it and add features. Toastman is one of those individuals, and my build of choice. I have been very pleased with the stability and feature set of the Tomato open source firmware. Another excellent alternative is dd-wrt, which a build by Kong is running on the above mentioned Netgear. Either choice accomplishes the need to make my low cost device perform like high end hardware. I am not a trained professional. This site, and the information presented here, is to be considered a work in progress. Duplicate at your own risk, as I take no responsibility for what chaos may ensue. © 2016 Walter Jevack - All Rights Reserved.